Money in the bank, fast. When we started last year, adding your bank account and withdrawing money into it for the first time could take up to 2 weeks. Wow, how times have changed. Today, we’re happy to tell you that you can add a bank account, verify it in seconds, and we'll show you the estimated arrival date. Now when you split dinner with your uninitiated friends, they can go from being Venmo newbies to having money in their bank accounts in 24 hours! We would love to hear from you, about this or anything else on Venmo. 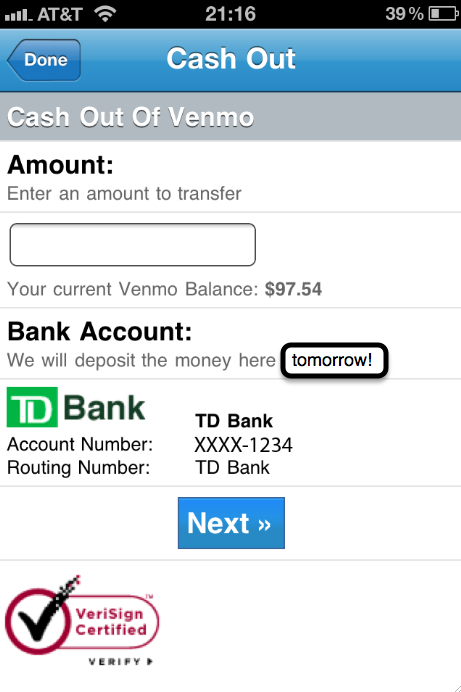 Talk to us at feedback@venmo.com.